Novel is available as a paperback and as an E-Book. Also available at Amazon, aRe, B&N and other retailers. If you’re looking for a happily-ever-after, you’ll find this book most satisfying. 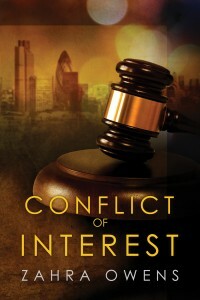 If you’re also looking for an extraordinarily well-written book, with scenes that seem to set themselves, evocative characters who jump off the pages, a total lack of melodrama and artifice in a surprisingly moving story, you’ll simply love “Conflict of Interest”. I know I did, and I recommend it with all my heart. This is a subtle, beautifully-written and exciting story that introduced me to a remarkably talented author whom I hope to read for many years to come.